Description: This file has pictures of how to attach the ribbons (and cards) to the bottle easily and quickly. All bottles come with free cards and gold pre-tied ribbons that easily attach to the bottle. Get the cards custom printed with your group's information for FREE when you purchase 480 or more bottles (cards must be of a single custom design). I have purchased Baby bottles for our campaign in the past and this year. They are beautiful and it gets the message out perfectly. We love the look and quality of these bottles! They are a little pricey on one hand, but on the other, the amount of change that we get returned to us pays for the bottles that we lose every time. Great product for your money. 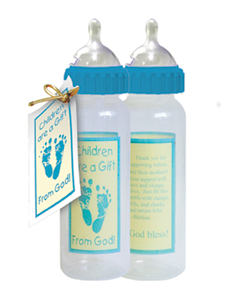 The baby bottles are a great way to raise money and awareness in your community. We have used these with youth groups in our area and they love filling them up and then bringing them back full to give to "babies". It's a precious way to involve young ones who don't really understand abortion but want to help mommies take care of their babies. They are beautiful and eye catching. We just received our Baby Bottles and love them! They are such an easy way to fundraise. Love the design and little cards that came with them. Not only are these baby bottles very very cute, they are also great quality that have lasted through many baby bottle drives. Every Pregnancy Center should definitely invest in these bottles for the baby bottle drive! We love these baby bottles! We have had them for many years, but recently need to order more as they do disappear over time. Great fundraiser for us. We like these, as the message is positive and graphics are eye-catching! Great to use in a campaign raising money to end abortions. I love the look and quality of these bottles. We really like the message they have on them, too. The only downside is that they are a little pricey for us. Love these bottles! They provided a great fundraiser. The logo is great and liked by families and churches. Our church distributes empty bottles each Mothers' Day and asks people to keep the bottle displayed as a reminder to pray for the unborn. The pro-life messages are great. Everyone returns their bottle with a donation, on Fathers' Day. 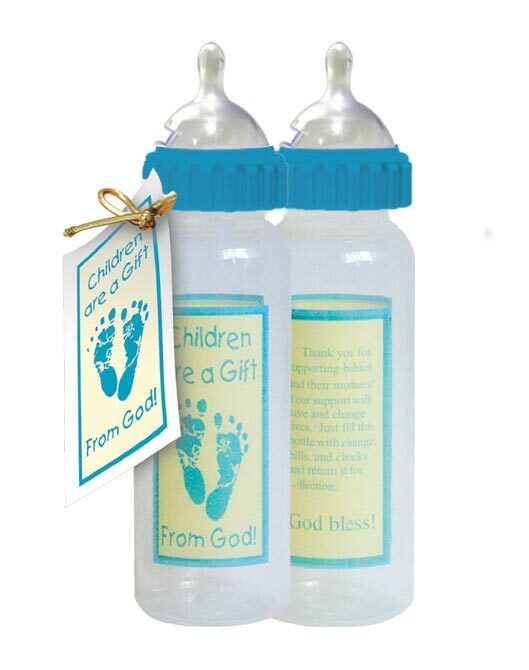 I use the baby bottles in our church's annual fundraiser for our local PCP from Mother's Day thru Father's Day. They have sparked much interest and allow less vocal prolifers to be more supportive. A great way to get others involved in the work of life affirming ministry of all ages. This has been an effective tool in raising support and when the bottles are filled we offer tours of our center which opens the doors to further engagement. These bottles have a great message! They are attractive and professional. 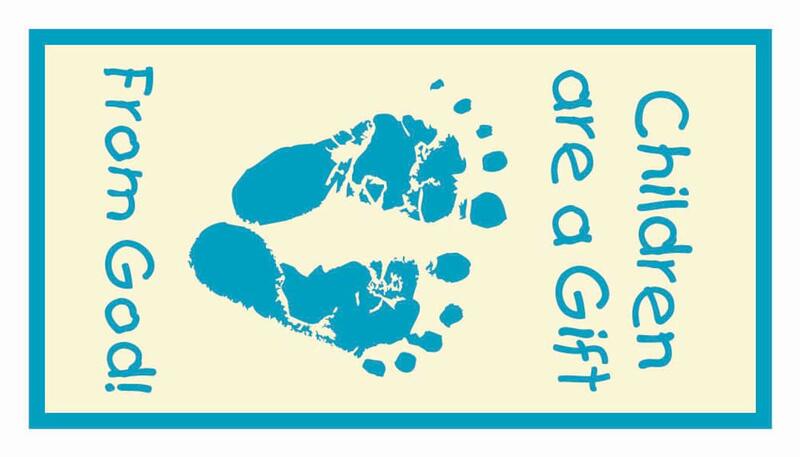 They are used in a great way for fundraising for pregnancy care/crisis centers. We send them out through your children's ministry as well as church wide. We can use them year round but love to send them home for Mother's Day and pickup at Father's Day honoring the full family circle! These bottles are great fund raisers. We deliver them to a church through a liason, usually at the same time we do a presentaion. We pick them up in 3 weeks full of coins and cash. We usually collect an average of $15 per bottle taken home by each person. The baby bottles have been a financial life saver for our crisis pregnancy center. We have a newer center. The bottles being accepted at Churches for fundraising purposes has been a great way for us to get the pro life message out while raising much needed funds. Perfect for baby bottle fundraisers. Great material and very stylish compared to some of the cheaper bottles we've used. Only complaint is that they can be a bit pricey unless you buy in bulk, which we aren't always able to do, so we can't seem to get enough of these. But as far as quality and visual appearance, they are top notch! We love these bottles! They have held up and served our center well for a long time. Huge success with the babybottles in our fundraiser. We will be doing this again in October! We give all the proceeds to our Project Gabriel for supplies for the Moms and babies. We have used these time and time again to raise money for our group. We send them home with the children in our church and have them bring them back the next week filled with change! It is a perfect fundraiser! The baby bottles were very eye catching and effective being well received bring in more money than plain bottles. The tags were very easy to attach and drew attention to what was printed on them. We have a couple of different designs of these bottles that we use for our Baby Bottle Boomerang Fundraiser we have done in the spring at local Churches. We have put very little work into this and have generated thousands of dollars for our center every year! We feel it has been worth the investment for our Pregnancy Center. Ordering baby bottles from Heritage is the best. We needed an emergency shipment since we ran out at a church campaign, and we had replacement bottles by the next weekend. Heritage House is the best place to order baby bottles from. We needed to have a shipment ordered immediately and they were great at getting the shipment to us. The ultimate way to raise funds! Distribute these bottles to your supporters with a request that every night they empty their change into the bottle, when it is full, turn it back in. It's as easy as that! Give your campaign a month, but at the end you will discover that it was an easy say to raise a significant amount of money with little manpower and time on your part.